Congolese rebel Tshibangu and Meru Aspirant Governor Mwenda connected by looted gold! The rebel and former Lieutenant General John Tshibangu who has left the during “Africa’s World War”. He has been reported and rumored to been a part of the M23, but that was never official, neither was any of his other enterprises since. He has been reported for violence in Kasai-Oriental in 2012 and trying to create a revolt in the Congolese Army. He has started and together with close members running a rebel group, who even recruits fellow rebels in Central African Republic as well as in the Democratic Republic of Congo. Here is some of the brief news from the rebel. Before the questionable transaction in Kenya, by the outlaw and the conflict minerals in the hands of Kenyan businesses. They should know better! “For John Tshibangu, his two collaborators were in Bangui visit because they have family on site. “Two of my men were arrested four days ago in Bangui: Colonel Freddy Libeba, my deputy in charge of operations, and Alexandre Mithsiabu, the intelligence director of our movement. They have their hands handcuffed since Friday, “also confirmed for his part, the colonel deserter of the Congolese army to the head of the FPCCD. He accuses Joseph Kabila of organizing the tracking of opponents inside and outside the DRC and said they fear for their lives if they were to be extradited. No demand for extradition has been formally sent by Kinshasa for the moment, but the will has been expressed, said one in Bangui. “We rose up because Joseph Kabila did not win the elections in 2011, and everyone knows. But we have been observing for a while the negotiations led by the bishops and we realize that Mr. Kabila does not respect the signed agreement. We can not let it happen because article 64 of the Constitution allows us to block the road by all means. That’s why we were raised, “said the FPCCD leader” (MediaCongo, 2017). “Friday, June 9, 2017, at least 3 relatives of Colonel rd Congolese John Tshibangu, were arrested in Bangui Central African Republic. They are Freddy Libeba and Alexander Mitshiabu, according to the confession of Colonel Tshibangu, who confided to the press because he fears that their extradition in the DR Congo. “I confirm that the two men were arrested. They are involved in activities of destabilization of the regime in the Central African Republic, but also in the DRC, “the Central African security and interior minister, Jean Serge Bokassa, quoted by Voice of America as saying on the telephone. The Central African statesman assured that an investigation is under way and further arrests may follow. “There are other acolytes who could be arrested. And there are many here. For now, we are leaving the case in the hands of the judiciary and we can later decide to extradite them to the DRC, “added Minister Bokassa. In the Central African Republic, the authorities are actively investigating the alleged members of the CTCCF, John Tshibangu, a Congolese political-military movement close to the former M23 rebellion suspected of links with Central African armed groups from the former Seleka. Investigations obviously triggered after the arrival of the Congolese Minister of Foreign Affairs, Leonard She Okitundu, three weeks ago. Freddy Libeba is a DR Congo subject who appears in the UN expert report of December 2016. He would have arrived in Bangui in July of last year. According to a source close to the investigation, he lived in the CAR under a false identity and was charged by the leader of the FCCPD, Colonel John Tshibangu, to recruit men from the Congolese diaspora rd and to conclude an agreement with an elder Leader of the former Seleka, Joseph Zoundeko, for possible operations in the DR Congo as in the Central African Republic. Since Zoundeko was killed, but Bangui suspects the CSCFP also to participate in the operations of the Coalition in eastern CAR” (J.N., 2017). When you would know that the rebel who are using all sort of funds to ignite violence and oppress people, even use it buy arms and ammunition to fight government and other militias, the Kenyan enterprises should sway away from the 1000 kilograms of gold worth USD 37 Million. This happen in April 2017, months before the news of violent and arrests of people surrounding his movement in Central African Republic, but it still shows the capacity of the former General in the Congolese Army. That he can cross borders and use his position to gain and train more rebels. This could only be done with the money to buy needed equipment and pay his ‘soldiers’. Because, Eye on Security Company received 1000 kilogram of unrefined gold. The monies of this gold and the value of USD 37 Million. This was put in Diamond Trust Bank. And put under the company of Sea Land Destiny Limited. This shows that illegitimate funds and conflict minerals are entering the Kenyan financial system and banks. “Eye on Security is a firm being supervised by an inside and out luxuriously experienced CEO. Mr. Mbijiwe Mwenda is a previous missile administrator in Kenya Air power. Aside from working air and ground rockets, this squadron additionally handles uncommon operations in counter terrorism and salvage operations. His administration as a marine has completely prepared Mr. Mbijiwe with sufficient learning of each point in security. Mr. Mbijiwe served in the power so passionately and he conveys even an uplifted level of passion to this firm. He is dead set to work with determination in making this nation and the whole world a superior spot to live” (Eye on Security – link: https://www.eyeonsecurity.co.ke/team/). The rich Security Analyst and CEO and founder of Eye on Security, has even been thought of as a Jubilee Candidate for Governor in Meru on the Jubilee Ticket. This was reported on KTN News earlier this year. He even had a statement of certainty of others, while the truth of his company isn’t that swell. “As a Meru leader, am ashamed that campaign materials of an aspirant or opposing party can be pulled down in a move clearly aimed at weakening them. This is undemocratic and cheap. Political victory is not gained by physically harming or maiming your opponent! Real men go to political battle democratically. They fight it out in the field and the best wins. No one goes high by bringing others down! We expect leaders to observe political decency! Only cowards do that kind of shameful thing! The youth is the strength of every rising community and they shouldn’t be misused. The role of the youth in politics is not to create an environment of despondency and violence but engage in constructive politics. Meru is greater than any individual, political formation or political movement. A people united can never be defeated” (Mbijiwe Mwenda, 22.01.2017). What is amazing on the claim of the corporation of the aspiring governor of Meru, Mr Mwenda stated: “We, Eye On Security, further confirm that the goods in our custody are legally earned and cleared of non-criminal origin, free on any liens or encumbrance and freely transferable upon the instructions only of the authoritized signatory (depositor)” (Eye On Security, Mr. Mustafa – placed on 12th April 2017). Certainly the company of the aspiring governor should know and look into the history of Lt. Gen. Tshibangu who is well-known rebel and recent history isn’t peaceful. Certainly, the company has no trouble with the way the gold came into their possession and how they transferred funds from Diamond Trust Bank. This story is clearly not been told and not been touched, how a Meru Governor Aspirant Mwenda are involved with Congolese Rebel and his looted gold. This is like novel, a fiction, but the paper that has been released proves the story. The other was just quick research on the fellows involved in the transaction. The rest is up to you and to see if someone differs on the story. Because the details are there and the others, are actual reported by various sources. Peace. Dismantling the Ten-Point Program of NRM – Uganda. i) Severe shortage of basic necessities like soap, cloth, housing, sugar, blankets, salt etc. iii) Disruption of life in most parts of the country leaving behind displaced people, orphans and widows. Constitutionalism and fair elections was part of this point in the program. NRM and Yoweri Museveni made a new launched in 8. October 1995. That their holding elections every 5 years (P.6, Poverty Alleviation Department, 2011). Restoration of security of all persons in Uganda and their properties: First they did disciplining the army – that got the NRA and UPDF together. Also restoring some safety and peace in the Northern Uganda with the operation to get rid of LRA and also stabilizing things in South Sudan. Keeping law and order with the run of things with UPF (P.11-15, Poverty Alleviation Department, 2011). Consolidation of national unity and elimination of all sectarianism. President Museveni said himself on 12th of May 2006: “Ever since 1986, when the National Resistance Movement (NRM) ended decades of state-inspired extra-judicial killings that accounted for the death of 800,000 Ugandans between 1966 and 1986, we introduced popular democracy based on a no-party model. In order to defeat the almost one century old sectarianism that had been fomented among our people and had been partially responsible for the upheavals that gripped Uganda, we avoided the immediate re-introduction of multi-party democracy. This model was not well understood abroad although it healed our people from sectarianism based on religious sects and tribes. We ignored the pressures from outside until we were convinced that the mindset of people had changed.”(P:16, Poverty Alleviation Department, 2011). Defense and Consolidation on National Independence: By doing this point was to get political independence. That wasn’t officially in place before 1986. Economic independence – that being the result of URA is now collecting 100 times more than it did from 1987 to 2010 (P. 19, Poverty Alleviation Department, 2011). Laying a basis for building: an independent, integrated, self-sustaining national economy. This has been done by becoming a part of COMESA and EAC. Also 20 policies have become bills to this date. Make opportunity for private sector development. Also the growth the ICT/Telephone business and the Oil exploration will give the economy a boost (P.21-25, Poverty Alleviation Department, 2011). Restoration and improvement of social services and rehabilitation of the war-ravaged areas. This has happen through the extensive expansion of the health care. Also the new standard in educational system in Uganda: “Article 30 of the 1995 constitution says that all persons have a right to education. Article 34 further states that “A child is entitled to basic education which shall be the responsibility of the state and the parents of the child.” The provisions notwithstanding, fewer than expected children were going to school. So while campaigning for Presidency in 1996, President Museveni noted that there were big numbers of children who were not attending school and/or dropping-out of primary school, largely due to failure by parents to meet education costs. He therefore promised that he would introduce free primary education if elected. Subsequently, the NRM government introduced (UPE) in 1997. Also the building of infrastructure of the road projects that has been over the last 20 years: “One of the major responsibilities for the NRM government is the construction and repair of roads. In order to properly plan for the road network in Uganda, the government formed the National Roads Authority which became functional on July 1st 2008 with the mandate of designing, developing and maintaining the national road network, currently at 20,000 km” (P: 25-32, Poverty Alleviation Department, 2011). Elimination of all forms of corruption in public life: “misuse of power for personal gain”. It’s been passed since 1986 – 8 laws that been passed to secure the system of bribes, corruption and grafts in the country. The NRM government has also put 8 agencies that follow up the corruption in the country (P: 33-34, Poverty Alleviation Department, 2011). Settling the peasants that have been rendered landless by erroneous “development” projects or outright theft of their land through corruption. “The land question has been in Uganda since the colonial times. Several legislations have been passed but they have not done much to solve the question. In the late 90’s and 2000’s, eviction of the so called squatters was so rampant that people always, petitioned the President for assistance”(P: 35, Poverty Alleviation Department, 2011). Encouraging co-operation with other African countries and defending the human and democratic rights of our long-suffering African brothers. “Over the last 25 years, President Museveni has ensured that cordial relationships with other countries are a top priority. Uganda’s foreign policy has been promoted putting in mind other foreign interests and ensuring that other countries do not undermine Uganda’s interests”. The achievement that the NRM government has done by this point is the Tripartite plus Joint Committee with Burundi, Rwanda, Uganda and DRC, Arusha Accord with peace in Burundi, Inter-Governmental Authority Development progress in Sudan and Somalia, EAC where Ugandan interested get a key place and the President involved with the peaceful resolution after the election violence in Kenya. Which is also the biggest trading partner (P: 37, Poverty Alleviation Department, 2011). Following an economic strategy of a mixed economy – I.E. Use of state and private sector as well as cooperatives in the development process. “Since coming to power, the NRM government developed programs to address infrastructural and economic challenges” (…)”The vision is that ‘every household in Uganda is able to access basic necessities namely: food, shelter, clothing, health and education for material and social comfort and be able to earn an income”. Also the push and to organize SACCOS and cooperatives to get a mix of business and government (P: 38-42, Poverty Alleviation Department, 2011). Point One: “The Movement dispatches vehicles to go around ferrying people to the polling station. Once people goes into the vehicles the buying votes begin (…) To ensure that the people who get the money deliver the votes, they insist that a Movement agent at the station votes on their behalf (…) In some villages like Kyeitembe and Nyakabirizi cows were slaughtered, and everyone who accepted to vote for the Movement was given a kilo of meat” (Kobusingye, 2010, P: 116). Museveni himself has pointed out earlier this year: “Uganda started off her Independence, in 1962, on a very weak foundation. This was, mainly, because of bad politics pushed by opportunistic sectarian groups and manipulated by external interests. The sectarianism, as we have pointed out many times, was based on religion, tribes and gender chauvinism (marginalizing the women). There were only three women that I remember in the Independence Parliament of 1962 to take one example. Within four years of Independence, the then Prime Minister had to abolish the 1962 Constitution because of the contradictions that were getting ever sharper” (Museveni, 2014). (P: 56, National Planning Authority, 2010). Discussing the points of education and infrastructure let me first address the educational policy. Baryamureeba says: “Uganda needs to consider reforming the education system if we are to focus on skills-development as a country. Primary school education should be reduced to six years and it should focus on setting a solid foundation or building blocks of the child’s education. At primary school level, children should master reading, writing and arithmetic” (…)”Primary school teachers are focusing on terminal national examination instead of imparting these essential skills. There are skills that are necessary at primary school level, but are not examined in the Primary Leaving Examinations (PLE). As a result, teachers focus less on such skills” (…)”All students, who complete primary education should be allowed to seek ordinary level education (O’level). At the end of O’level, students should sit the Uganda Certificate of Education (UCE), which is a national examination” (…)”free education should be provided at primary school and O’level education only. Beyond this stage, education should be optional and the students should meet the costs. The Government needs to stop providing free education beyond Senior Four, because it is neither strategic nor sustainable” (…)”Then Grants Board should have clear guidelines of how these institutions can access funds and to what levels. This would reduce on strikes in these institutions as a result of demanding for more funds from the Government” (Baryamureeba, 2013). On infrastructure study on economic planning and building in Pallisa and Soroti: “The planning of roads should factor in the economic potential of areas as the current system under MoW only considers roads in bad situation. This will improve on accessibility to areas that have identified themselves as economically productive” (..)”The level of funding for roads should be increased both under machine based as well as labour based methods. The latter method was seen to be effective in contributing to income earning opportunities of the local communities which helps government achieve twin objectives of poverty reduction and road provision” (EPRC, December 2010). Let mention a few: The Dr. Latigo scandal of 1986 – the Uganda Airlines payoff that made him lose his top position over the airline. Another one was Santana Vehicle Saga in 1988 where the Ministry of Defense wanted ‘Land-Rovers’ but this deal between Uganda and Spain made the deal for Santana’s. They had paid for 260 Land Rovers and not Santana’s so that $6,8m worth Santana’s shipped versus the $8m Land Rovers that the bid was set for(Mugabe, 2013). We also had the CHOGM 2007 the dealings with Mr Mahogany and Mbabazi that there was huge mismanagement of public funds that was we’re meant for the CHOGM 2007. Also the Global Fund 2008 the scandal of drug and malaria. The money went to phony organizations and also take-away money to PMU. Termangalo land scandal the deal between NSSF and Mbabazi that forced the fund to buy the land. The ID Scandal of 2010 where the Government borrowed a lot of money and never kicked off the project (New Vision, 2013). This shows how little serious the 8 laws and the agencies that supposed to follow the monies that are giving and shared from the government to different entities. So I do think I will comment it further. To prove some of the actions of the government that opposes the ideal of Point eight. “Agnes Kirabo, the FRA Coordinator, says there is no need for any apology to Ugandans or the President and that it is the President himself who should be concerned at the spate of the land grabbing vice considering that it is at the heart of failing his Ten Point Programme” (..)”Sources at ULA say that the ministry has in the past investigated their sources of funding and warned them against getting involved with Mubende issues where over 22,000 residents were evicted from their land, their crops destroyed, houses burnt from about 10 villages by security operatives to give way for a plantation forest by UK’s New Forest Company Uganda Limited (NFC) on the orders of President Museveni” (…)”Oxfam and ULA also rattled the government when they released a report indicating that 22,000 were evicted from their land in Mubende. When this reporter travelled to Mubende at the height of the crisis, officials at the Resident District Commissioner’s office which handles the land issues (showing the president direct involvement since RDCs answer mainly to the president) said that Oxfam had done a false report and asked the reporter to go back to Kampala” (…)”FRA, for instance, invited hundreds of peasants who testified about loss of their land to investors, government and army officials. The NGOs launched the land losers’ directory on the same day. The book is intended to document all land losers” (…)”Orombi noted: “UJCC welcomes the ongoing initiative by civil society organisations that have brought together ULA, FRA and UJCC whose main aim is to educate Ugandans on their rights and challenge oppressive systems and structures that have led to unlawful eviction of thousands of Ugandans from lands they have occupied for generations. (…)”But a more contentious one that has already pitted activists against President Museveni is the Amaru eviction of over 10,000-17,000 people from Apar into pabbo sub-county. Although president Museveni has in the past threatened to deal with those who claim that government is behind evictions, increasingly, he is personally directing more and more evictions including this one and the evictees themselves are coming out to criticise him”(Matsiko, 2012). “In 1983 and 1984, six countries in the Horn of Africa – Djibouti, Ethiopia, Kenya, Somalia, Sudan and Uganda – took action through the United Nations to establish an intergovernmental body for development and drought control in their region. The Assembly of Heads of State and Government met in Djibouti in January 1986 to sign the Agreement which officially launched IGADD with Headquarters in Djibouti. The State of Eritrea became the seventh member after attaining independence in 1993(IGAD, 2010)”. Somali Prime Minister Abdi Farah Shirdon Saaid commented this: “The Ugandans have contributed significantly and a lot, and this is now a critical moment and in light of that we are of the view, if the media reports turn out to be true, it may be a challenge”. On the same note the Ugandan Foreign Ministry said in a statement: “Uganda’s withdrawal from regional peace efforts, including Somalia, CAR (Central African Republic) etc would become inevitable unless the U.N. corrects the false accusations made against Uganda, by bringing out the truth about Uganda’s role in the current regional efforts” (Biryabarema, 2012). “Ugandans lead a 5,000-soldier strong contingent of African Kony-hunters operating all over central Africa, and their presence in the CAR falls under a continental mandate” (…)”Paddy Ankunda, Seleka were targeted because they have somehow allied themselves with the LRA. “We know we don’t have that mandate but since [Seleka] are in bed with our enemy, we’ll treat them as such,” he said. “Seleka had never tasted our fire. I think it was important that they taste our fire so that they are careful.” (…)”in May, Ugandan foreign minister Sam Kutesa promised the United Nations that his country would contribute 400 peacekeepers to MISCA, the African Union-led peacekeeping force in CAR (in September to become the UN-led MINUSCA)” (…)”Given Uganda’s public description of Seleka as “the enemy”, can Uganda really be trusted to act as a guarantor for peace?” (Allison, 2014). “President Museveni said that the issue of their remuneration was well appreciated by the Government. However, said that the NRM Government had decided to embark on national development through emphasizing building infrastructure, such as roads, so that they would be used by the population to get homestead income. He stressed that without roads and infrastructure in general, the country cannot grow.“Infrastructure such as roads and electricity were the foundation for development. Having it right in the economy would attract investments that would in turn increase employment opportunities and income generation in the country” (MediaCentre, 2014). Now I have been beating every single point of the program. I just had to. Hope it was worth the time put in…I was thinking of adjusting the ten-point program versus Vision2040. But to address it properly would be too long and wouldn’t be sufficient in this form a blog. 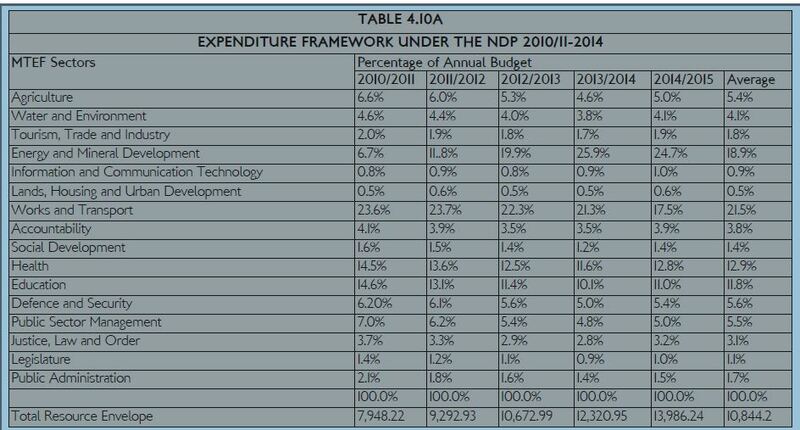 I sure have more evidence of how the NRM regime hasn’t lived up to the promises of the ten-point program. This is just a cup of tea. So hope it was sweat. Peace. Prof Baryamureeba, Venansius (27.06.2013): ‘Uganda’s education system needs overhaul’, New Vision, Uganda. Kobusingye, Olive (2010): The Correct Line – Uganda under Museveni, AuthorHouse, Milton Keyes, UK. Mugabe, Faustin (24.02.2013): ‘High-profile corruption scandals registered under NRM’ New Vision, Kampala, Uganda. National Planning Authority (April – 2010): ‘National Development Plan – 2011/12 – 2014/15’, Kampala, Uganda. 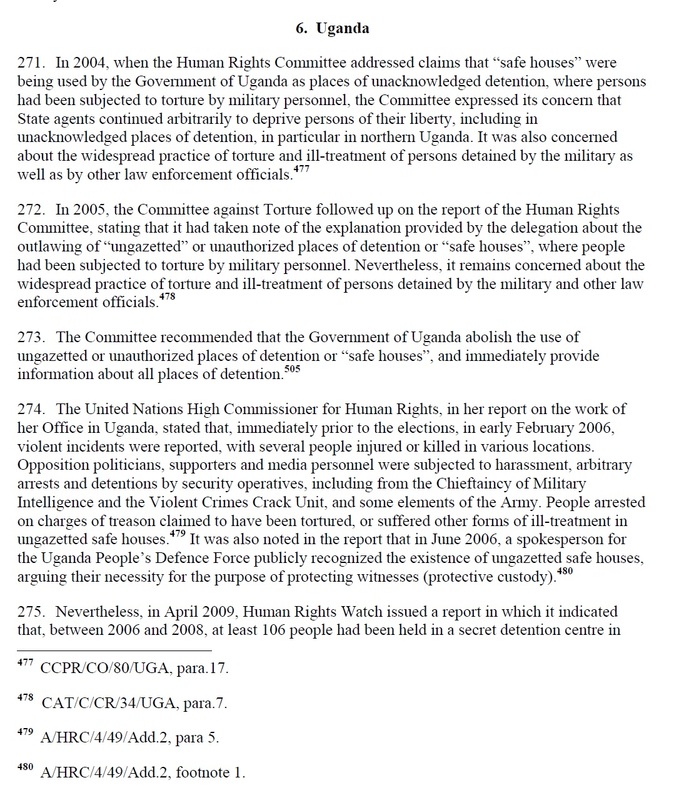 United Nation General Assembly – Human Rights Council (19.02.2010) – A/HRC/13/42, Detention Report. In 1990 Yoweri Museveni gave the Millitary Academy in Bombo a document explaining how to fight counterrevolutionary insurgency (Museveni 2000, S: 132). Why I am pointing this out today. It’s because of the tragic events in Kasese and Bundibugyo(Bagala, 2014) where its reported now 90 dead. The document was in a book published in 2000 called ‘What’s Is Africa’s Problem?’ Then I will address this document and this with the state it is in today. With doing so, I will there after discuss short history of ADF, LRA, ADM and UMLA whom all interconnected. After that show how the ADF has reacted to recent events and how we come to the news of recent of the tragic deaths in Kasese and Bundibugyo. This will be long post, but hopefully this will give you some new knowledge on the matter. The cause of the government must be for a just one. First Point: Fight illiteracy and make government policy on land for the population (Museveni, 2000, S: 132). In 2014 there new reports of bad schools and its sorry state, Margret Nakitto the Mukono Muncipal Education officer explains to Red Pepper: “We as a municipal, we always carry out village meetings with communities where the locals identify their basic necessities then we handle them over to the district that in most cases has positively responded to our requests”, she continues:” Active learning is in government schools unlike private schools that hire mercenary who force pupils to cram what they do not understand”(Red Pepper, 2014). Second part of first point is to rebuild infrastructure (Museveni. 2000, S: 133). Museveni himself said for the budget in 2014/2015: “Uganda is now connected from corner to corner. You can now drive on tarmac road to all corners of Uganda. As a result of this shift in resources, Uganda has achieved connectivity across the country” (State House, 2014). So we have to see if that is true. The weakness of the national economy can lead to counterrevolutionary insurgency (Museveni 2000, S: 133). World Bank reports that since 1986 to 2014 the Gross Domestic Product (GDP) has gone from around 4.80 Billion USD to 21.48 billion USD (World Bank, 2014). There would be issues with ideology, political and general conceptual underdevelopment (Museveni, 2000, S: 133). Reasons for underdevelopment in Uganda stemmed from the colonial administration into the new independence policies of manufacturing. The government continued with the new policies of to the agricultural sector. In agricultural sector has the focus is on the traditional foods and also the non-traditional for export like coffee. Structural Adjustment Program (SAP) has liberated the economy and also opened for more unemployment. SAP was abounded in 2009 where the focus turned into a principal marcoeconomics element such as economic growth to trickledown economy, inflation control, and export of raw materials, and also to focus on the Millennium Development Goals (MDG). Kashumbashi writes: “Uganda is now defined as a failed state vulnerable to domestic and external shocks including inability and /or unwillingness to control borders against the influx of illegal immigrants that have heightened political tensions as competition for services and resources particularly land ownership intensifies. Thus, notwithstanding its huge resource endowment and strategic location, Uganda remains mired in under-development and extreme poverty because of unfavourable economic policies and political instability, civil wars and violation of human rights and fundamental freedoms”(Kashumbashi, 2014). Second Point: The cause of the government must be for a just one (Museveni, 2000, S: 134). Where the focus was on correct building of the army and graduation of the military (Museveni, 2000, S: 134). Museveni says: “Military training is not easy. It is tough but builds your stamina, body and character”(…)”This emphasis you have done, of political education and discipline is very welcome and I want to thank you very much for that”(UGO.co.ug, 2014). Third Point: Politicizing a Confused Population (Museveni, 2000, S: 136). That the manipulation of the population and peasantry ignorance and bandits taking advantages previous political mobilization. There could also be tribal intoxicants with the issues between the “south” and the “north” (Museveni, 2000, S: 137). With the basis of the discipline of the army would give security to the population. Good prompt management and utilization of intelligence information for the government (Museveni, 2000, S: 137-138). Col Felix Kulayigye said “the truth telling process could turn chaotic since most of the conflicts in the country were tribal” (…) ”while many people keep accusing government of wrong doing yet there are many civilians and religious leaders who protected insurgents especially during the Lord’s Resistance Army rebel conflict” (Red Pepper (2), 2014). So there must be done something wrong by the government and the plans that Museveni had in the 1990 unto 2014. Fourth Point: Diplomatic Weapons (Museveni, 2000, S: 139). If you handle diplomacy in the right way and manner then will you get the weapons you need, and when you need them. So that continuance of weapons needed to combat counterrevolutionary insurgency (Museveni, 2000, S: 139-140). If the numbers from NationMaster can be used as a guideline, approximant number of UPDF forces (exact number of forces in 2000) it was 50.000 Armed Combat Forces. Battle-related deaths were in 2007 up to 91. The price of the army per capita was 6, 13 USD. Use of GDP was 2, 9% was in 2006, in 2013 down to 1, 8 % of GDP. Personnel for the army were up 47.000 in 2005. The amount of Weapons Holdings the UPDF had in 2001 was 286.000 (NationMaster, 2014). So if this numbers are somewhere near the truth of today’s picture, Museveni sure has made a well spent with Diplomatic Weapons. This was how Museveni himself in 1990 commented on how the Ugandan government should succeed in beating the issue of counterrevolutionary insurgency. This week we saw the second guerilla group in 20 years attacking northern parts of Uganda. The most famous one is LRA (Lord Resistance Army). LRA now is on the run between Central African Republic (C.A.R), Democratic Republic of Congo (DRC) and Sudan; they are on the run from UPDF who is going after them there. This has led to clashes with ‘Seleka’ in C.A.R which wasn’t intended in general, but rumors are out that ‘Seleka’ is supporting LRA (Ronan, 2014). It started first of in Uganda as Ugandan Muslim Liberation Army (UMLA) this after they accused NRA (NRM) killing Muslims in 1979 at Nyamitaga in Mbabara and also the killings of Muslims at Butambala near Mpigi (Prunier, 2009, S: 84). UMLA was founded in January in 1995 (Prunier, 2009, S: 84). Monarchist of the Baganda Kingdom of Uganda wasn’t happy with the restoration of the Kabaka Mutesa II that happened in 1993 and became only a cultural institution with no power. Allied Democratic Movement (ADM) was founded in London later in January 1995 (Prunier, 2009, S: 85). The UMLA had it firsts attacks were in February at Buseruka, near Lake Albert in Bunyoro. This was on 20-28 February 1995 and went bad for the UMLA. So they fled the area and settled down in Bunia in DRC. Through the met of Tabliq a Khartoum supported group who worked together with Sudanese Army Security Service who controlled at the time Bunia Airbase and Khartoum was hostile to Uganda and NRM (Prunier, 2009, S: 86). This sponsored relationship from Khartoum led to the alliance of the ADM and the UMLA, whom became in the DRC the ADF (Prunier, 2009, S: 87). ADF made a mark 13. November 1996. Museveni called Mobutu and told he would enter DRC to attack the ADF guerillas at their bases in Kasindi, DRC and Mobutu was surprised. Then leader of ADF Ssentamatu Kayiira said “to reintroduce multi party politics in Uganda, stop Museveni’s nepotism giving all the juicy jobs to Westerns (meaning people from Ankoli and Kigenzi) and re-establish cordial relations with Uganda’s neighbor” (Prunier, 2009, S: 120.121). 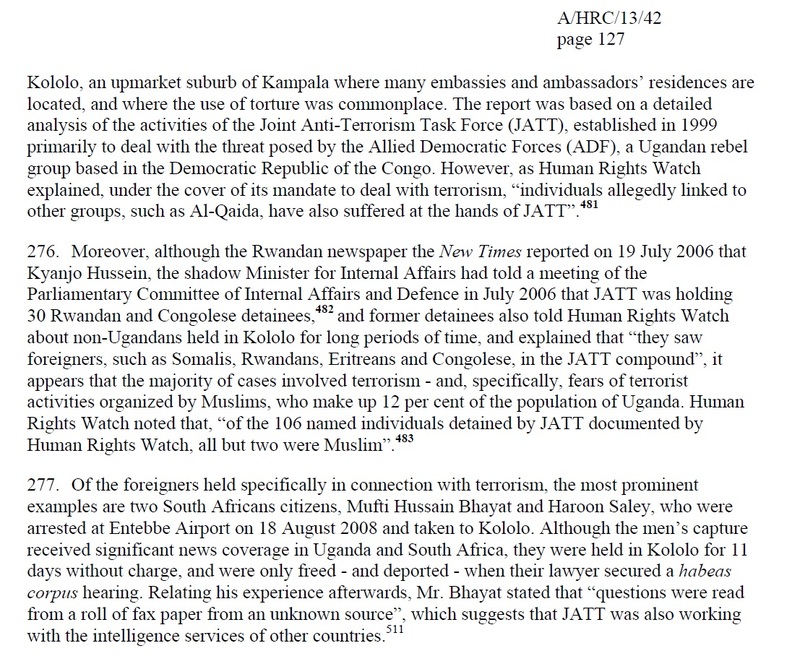 This made Museveni enters the conflict at the time in DRC and fight ADF in Bunia and Kasindi (Prunier, 2009, S: 121). By mid-October in 1998 Museveni went into Sudan to fight to both strike back at LRA and also ADF since they got air support from Juba, the numbers was up to 50.000 IDPs in January 1998 and by July 70.000. Amama Mbabazi was commenting on this at the time: “Khartoum’s plan is to destabilize the region to prepare the ground for the spread of Islamic fundamentalism and Arabism”(Prunier, 2009, S: 196). MONUC (UN Peacekeeping Force in DRC) hunted down with FARDC the ADF in late December 2005 where they ended up killing 86 ADF combatants (Prunier, 2009, S: 208). Later the ADF still exists, but not only as guerrilla force on the footholds of Ruwenzori to a rogue mining company. They are not seeing in Kampala as a threat anymore, but something of the past (Prunier, 2009, S: 321,322). Recently suggest that ADF-NALU has 800 to 1.400 combatants in the DRC-Uganda. The funding of the organization is off Illegal logging and gold-mining, this money is being handled with a network of cars and motorcycles, this then being transferred to and from London, Kenya and Uganda. There has been attempts crush the guerrilla army in 2005 and 2010 (IRIN, 2014). Lt. Col Paddy Ankunda of the UPDF and he comments: “The threat is real. ADF is recruiting, training and opening new camps in eastern DRC. We are alert and very prepared to deal with any attack on our side of the border” (…)”We are sharing intelligence information with the DRC government [and] FARDC [DRC’s national army] about their activities. We hope FARDC will be able to deal with the group” (…)”There is no doubt; ADF has a linkage with Al-Shabab. They collaborate. They have trained ADF on the use of improvised explosive devices” (…)”What is worrying us is that the ADF has been carrying out a series of abductions, recruitment and attacks in DRC without much resistance from FARDC”(IRIN 2, 2013). This is after what he said in 2013 and still nothing said about in international press or any action from them. Stephen Oola commented also: “The allegations that ADF is regrouping are not new and should not come as a surprise. What should worry us as a country is the apparent collective amnesia of treating our own exported armed insurgencies as other people’s problems” (…)”The LRA [Lord’s Resistance Army] and ADF are Uganda’s problems and will remain so, no matter where they are located at a particular time, until we seek a comprehensive solution to conflicts in this country”(IRIN 2, 2013). Museveni commented himself to African Report this in August 2013: “I have told President Kabila and the UN that they should deal with these killers” (…)”We can’t have neighbours who are murderers. ADF killers are in Congo, if they dare to if they dare to attack Uganda they will suffer the consequences” (…)”I urge Ugandans to look after our people fleeing the conflict in Congo. These are our people, the boundaries are foreign” (…)”Slowly by slowly we shall bring Africa back together. An elephant always carries the weight of its tasks however heavy” (Olukya, 2013). Museveni congratulates Kabila on 2. December 2013 said “The DRC army operations overrun the headquarters of the ADF in the Eastern Region. I want to thank President Kabila and congratulate him upon this successful operation of flashing out the ADF” (NewVision.co.ug, 2014). What Museveni failed with his counterrevolutionary insurgency plans from 1990? My suggestion would be that he didn’t follow the four points of the 1990 military document given to Bombo Military Academy in Uganda. Museveni and UPDF can’t fight the right wars since they can’t have done that, then this kind of armies wouldn’t exist still after 20 years and making havoc in Kasese and Bundibugyo. The cause for safety of their own citizens should be JUST one, but does this matter at this point for the UPDF? They are used in Somalia, South Sudan, DRC and C.A.R, are there still forces to use in the country? If they are, where are they stationed at and how hungry are they? Since you can’t let the ADF just walk into your territory and start shooting without any warning, then killing both army personnel and also civilians.Politicizing the population is captured in the second point, how can a government and police let a guerrilla just walk over the borders and make hazardous event and tragic outcome. That UPDF isn’t stronger in the area must be a wake-up call for the brigadiers and generals of the Ugandan Army. This must be an answer to the ADF battles in 2013 and now their revenging the UPDF and DRC army. Fourth point is Diplomatic Weapons, I am sure that Museveni and UPDF getting the weapons he need. He has recently been in Russia and become more connected to them, also his ties to USA in the fight against LRA and the Al.Shabab in Somalia. UPDF is sure getting the modern weapons of this time from them and sure it’s part of the aid. Paddy Akunda: “There was an attack by tribal gunmen on our barracks in Bundibugyo [Western Uganda] and we repulsed them, killing so far 41 of the attackers. The operation is ongoing”(AllAfrica.com, 2014). Ms Namaye says: “he attackers were coordinated by local leader and politicians, who are yet to be interrogated” (…)”Investigations are pointing to area politicians and a witch doctor who hails from Democratic Republic of Congo who helped them attack out stations” (Bagala, 2014). Lt. Ninsiima Rwemijuma has commented: “More than 80 suspected militants are now in custody”. The military is saying ‘it’s not a full blown insurgency’. They suspects it to be: Obusinga bwa Rwenzururu. Who is a part of the Bakonzo tribe and have a long tense relationship with neighboring tribe Bamba. Rwemijuma continues: “It is hard to confirm that this is a rebel group or not” (…)”This is a subject matter that needs investigation” (Muhumuza, 2014). More interesting reports are armed men went into the barracks of Kasese and took ammunition from the place. Also fears of civil war sparking off in Kampala. Even UPDF Officer has reported that tanks has vanished and soldiers. Muzhoozi is reported also to hold a dozen meetings over the political unrest (Welinformers.com, 2014). 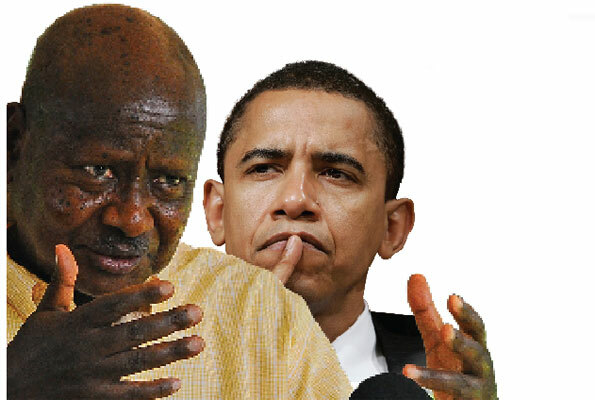 Museveni, Yoweri K. – What Is Africa’s Problem? (2000), University Of Minnesota Press, USA. Nå som UPDF suspenderer sin jakt etter Kony og LRA i den Sentral Afrikanske Republikk(CAR) som ligger på Human Rights Index: 180. I landet som har igjen blitt utsatt for kupp – Bozize som selv tok makten ved kupp i 2003 fikk oppleve den samme skjebnen som siden forgjenger. Djotodia som er den nye president har også gjort seg til minister for militæret. Samtidig som dette skjer, så skjer det nye krigføring og terrorisering i Sudan i Darfur. Sør-Sudan har heldigvis begynt å produsere olje igjen etter en ny akkord med Khartoum. På grunn av flyktningstrømmen skaper dette problemer i Chad. Der president Deby var valgt inn for fjerde term i 2011. Ikke akkurat på HRI på 184 plass. Sør-Sudan er enda ikke på listen sammen med Nord-Korea. Dette viser hvor innflukt området er. Snart skriker Invisibel Children organisasjonen igjen. Lure på om påstanden kommer til å være den samme. Regjeringer som mest kontroll rundt hovedstaden. Slik som i CAR. Djotodia og juntaen Seleka(oversatt: Alliansen) hadde en skjør fredsavtale med disse etter forrige valg. Denne så Djotida som ubrukelig og dermed tok til våpen og gikk hele veien til Bangui. Derfor fordi har Alliansen satt kampen mot LRA på pause. UPDF vil sikkeret finne andre gjøremål enn så lenge. Siden nordlige Uganda er blitt fredlig. Men om LRA forsatt er sterk nok til å komme tilbake til DRC. Da vil veien være kort tilbake til Gulu og Lira. Sør-Sudan og SPLM har sikret ny-dannelsen av staten. Selv om den har vært trøblete. Ikke minst fordi alle har visst at Omar Al-Bashir aldri ønsket å splittet riket som gikk fra Egypt til Etiopia og Uganda. Akkurat som avdøde Meles Zenawi aldri hadde ønske om å splitte Etiopia i sin tid og frigjøre Eritrea. Nå er det en flyktningstrøm på vei fra Darfur til Chad. Som ikke har ressurser. FN er der og driver arbeid. Der de lengter hjem. Noen flykter hele veien igjennom Niger og Mali til Libya for å komme til Europa. Når man vet hvordan situasjonen er i Mali med Franske styrker og kamper. Kan man bare tenke og sukke for en kamp og reise for å få en anelse av friheten vi tar som selvsagt. Vi kan lure på om disse hendelser skal skje en dag med oss. Om våres kyster og samfunn skal rystes av militære. CAR er det usikkerhet, deler av Sudan er det usikkerhet. Den store flyktningstrømmen til Chad. Som må være stor, selv om de har det jevnt siden før vestlig media og Angelina Jolie ble UNICEF ambasadør i 2004 og poserte med tv-kamerane foran en flyktningleir i Chad. Noe som forsatt holder på og flere flykter. Ingen bryr seg, det er ikke like kult som for ti år siden. Akkurat som det eneste som regjeringene verden rundt har gjort med myndighetene i CAR. Er den ene tingen å ikke anerkjenne den. Ingen anerkjennelse. Frankrike vurderte å forsvar Bozize som var deres alliert, men hadde nok med krigføringen i Mali. Siste årene har de også vært inne i Elfenbenkysten og Libya. Disse var nok viktigere for Françafrique og franske interesser på kontinentet. Så jeg venter i spenning i hvordan situasjonen vil utvikle seg, om LRA vil angripe. Når UPDF vil gå til angrep på rebellene. Lure på om SPLM kommer til å gå med på videre kamper mot dem senere. Vil verden godta den nye presidenten Djotodia i CAR. Ikke minst om verden vil la Omar Al-Bashir holde på med galskapen i Darfur og om verden vil vende blikket vekk fra Chad. Ørkengrensene i mellom vil forsatt være åpne og dermed skape usikkerhet. Å om regjeringene vil bli sterke nok eller om de blir holdt svake fordi de skal være avhengig av lederen vil gi betydning til framtiden i regionen. Akkurat som alle andre plasser. Bare i en helt annen situasjon. Måtte det bli ro og fred i regionen. Noe det ikke har vært på en lang stund. (Har sikkert en del feil i min vurdering, noe som bare skulle mangle. Vil bare kommentere fordi jeg ser sjelden noen andre som villig kommenterer og redgjør skikkelig for situasjonen).